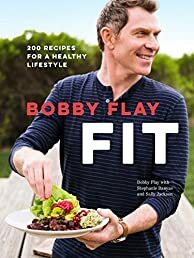 Cook, eat, and be fit with 200 recipes from Bobby Flay, whose approach to healthy eating is all about flavor—not eliminating anything from your diet. With a profession that has him constantly developing and tasting new recipes, chef Bobby Flay does not eschew any foods: bread, bacon, and butter are still all on the table. His secret to staying healthy is to have on hand an arsenal of low-calorie flavor bombs—like rubs, relishes, and marinades—to transform lean proteins, whole grains, and fresh produce into craveworthy meals at home. In Bobby Flay Fit, Bobby shares smoothies and juices, breakfast bowls, snacks to fuel workouts, hearty salads, nourishing soups, satisfying dinners, and lightened-up desserts. With fitness tips and a look into the chef’s daily healthy routines, this cookbook is for those who want to eat right without overhauling their pantries or sacrificing taste.